crunch-a-tize me, cap’n. | everything will turn out alright. every night, right around this time, the cap’n and i make it happen. cap’n crunch has long been my favorite sugary not-so-good-for-me cereal. travis just doesn’t understand it. i try to explain to him about the nuance of flavor, the hint of saltiness, and the way those sweetened pieces of craggy yellow #6 lovingly cut up the roof of my mouth. nothing. he won’t go near that bright red box. that’s okay. more sweetened corn and oat cereal for me! hey, at least each bowl has 100% of my daily folic acid requirement. sylvie can thank the cap’n for her lack of spina bifida. what’s your biggest pregnancy food indulgence? Ha! Great post. You are a very inventive and engaging writer. I must say that I am to blame for Travis’ distaste of Captain Crunch. The Captain was never one of my favorites, so I never exposed him to it. But I am ready to discuss the awesomeness of Fruit Loops or Frosted Flakes. Oooh. I do love Frosted Flakes! And Golden Grahams. OMG!! My favorite EVER! EVER! Aughhhh, I’m not pregnant BUT I do get crazy weird cravings all the time. The other night at 2am I couldn’t restrain myself and I counted up what little change I had and went to the store and bought some cottage cheese (WHICH, by the way, I ate all in one sitting!) But this week–it’s green olives. I’m eating them now. I eat jars full in a sitting if I don’t stop myself. Haha. I think I got stronger cravings for things before I got pregnant. My diet wasn’t as restricted then so I wasn’t constantly talking myself out of yummy things! Mmm, sad. I seriously love the thought of someday, for nine months, being able to justify my crazy cravings. HAHA! I forgot all about Cap’n Crunch! I used to let it get a little soggy before I would dive in. My pregnancy weakness is definitely Ice Cream. I am no longer allowed to buy ice cream because I would eat it all within two days. So I can only indulge myself my walking to the local ice cream shop and buying a cone. 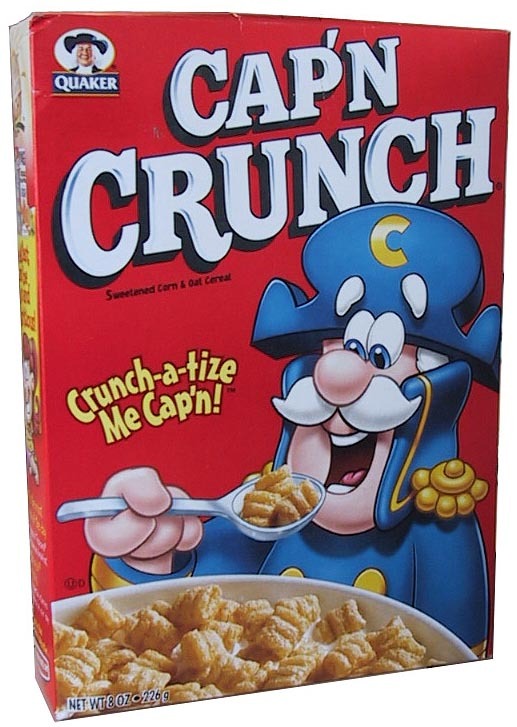 I like my Cap’n extra crunchy so I eat it really quickly after the milk hits it! I LOVE ice cream. I’ve made the switch to frozen yogurt because of the gallbladder. It still satisfies that craving, but it’s much healthier! I get way more food aversions than cravings. Nothing ever sounds good to me! That said, after reading this I am begging my husband to go pick up some cap’n crunch. I also like milk a lot more than I did pre pregnancy (especially chocolate milk)! Don’t even get me started on the amazingness that is chocolate milk! Haha great post! I used to eat captin crunch- with crunch berries and my grandfather told me once that they would make me puke in technicolor. Fruity Pebbles will do that, too. I have had phases with cereal this pregnancy. First it was grape nut flakes, then special K with strawberries, then a short cinnamon toast crunch phase, now it’s lucky charms! But this post makes me want crunch berries – bad. It’s funny to see how it started out kinda healthy, but it’s all sugar now! However, my husband loves it now that I’m buying cereal with prizes in them. I know exactly what you mean about starting out healthy and progressing to sugary. I started with Kashi this and bran that. I still do a bowl of Kashi in the morning, but my evening bowl is always some tooth rotting delight!